Abu Hamza al-Masri has been found guilty of supporting terrorism by a court in New York and sentenced to life in prison. But who is the man who became the most prominent radical cleric in the United Kingdom? In London, one of his first jobs was as a nightclub bouncer. He married a British woman who he says encouraged him to embrace Islam. "I took time off from the clubs and I enjoyed it," he said at his trial in the US. He decided to resume his studies at Brighton Polytechnic and gained a civil engineering degree, joining the Institution of Civil Engineers where he remained a member until 1994. His marriage rapidly broke down but he later remarried and had seven children. One of Abu Hamza's first major engineering contracts took him to the Royal Military Training Academy at Sandhurst. Technical drawings of the college were still in his home when he was arrested in 2004. In the early 1980s the young Abu Hamza started to show an interest in Islam and politics. He was heavily influenced by the Iranian revolution. Some Muslim thinkers were calling for Islamic states in Islamic lands. They had a military face in the Mujahideen fighters who, backed by the US, emerged to oppose the Soviet Union's occupation of Afghanistan. In 1987, after meeting Abdullah Azzam, an influential supporter of the notion of Muslims being obliged to fight jihad, Abu Hamza moved to Afghanistan. It was around this time that he lost an eye and both his hands. Accounts of exactly how and where the accident happened conflict. It had been claimed his distinctive features were the result of an explosion while he was taking part in a demining project in Jalalabad, Afghanistan. But at his US trial Abu Hamza said it happened while he was working with the Pakistani military in Lahore when an experiment with explosives went wrong. He returned to the UK in 1993 for treatment. But within two years he had left Britain again to support Bosnian Muslims during the break-up of the former Yugoslavia. 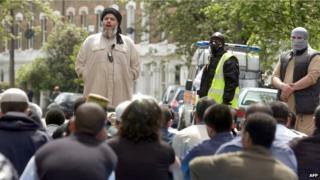 In 1997, he arrived at Finsbury Park Mosque. There are suggestions the police and intelligence services were already watching Abu Hamza along with other militants at this time. According to Abu Hamza himself, MI5 first contacted him in 1997 shortly after extremists massacred 68 tourists at Luxor, Egypt. But it was in 1999 that he came to national prominence. Scotland Yard questioned the cleric on suspicion of alleged bomb plots in Yemen. While Abu Hamza was released his son Mohammed Mustafa Kamel was jailed in Yemen for three years for involvement in an alleged campaign of violence. He was delivering almost all the sermons. On the first anniversary of the 9/11 attacks, he co-organised a conference at the mosque praising the hijackers. Five years later the trial of the men later convicted of the failed 21/7 London bombings heard several of them had gone along to hear Abu Hamza preach. Other convicted terrorists have been linked to Finsbury Park. On 20 January 2003, police raided the building as part of a major investigation into an alleged plot to produce ricin poison. They sealed the mosque and returned it to the trustees. Five months later, he was charged with 15 UK offences associated with his sermons and terror handbooks found at his home. He was convicted on 11 counts and was jailed for seven years. The American authorities continued to pursue his extradition. Following an eight-year legal battle, he was finally extradited in 2012. He went on trial in New York accused of offences including plotting to set up a terror camp in rural Oregon, intending to provide support for terrorists in Afghanistan and in connection with the 1998 Yemen attack. He denied all the charges but was found guilty in 2014, with Manhattan US Attorney General Preet Bharara saying: "Abu Hamza was not just a preacher of faith, but a trainer of terrorists".